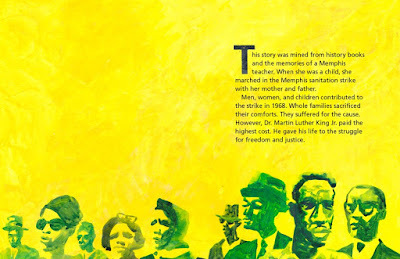 As we get ready to celebrate Dr. Martin Luther King, Jr. Day, I want to share a powerful new book about his work. 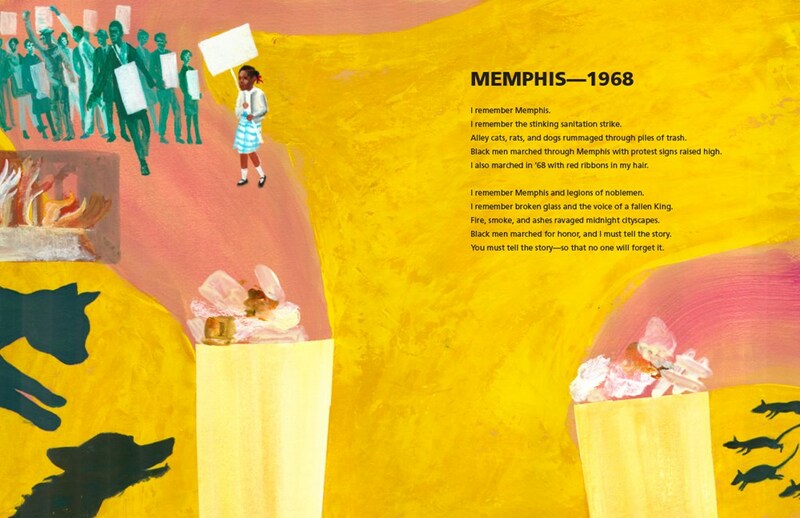 Alice Fay Duncan's powerful picture book gives context for King's work, helps explain his assassination, and provides inspiration to keep dreaming big. We often talk about Dr. King's legacy leading nonviolent protests and fighting for civil rights, but I'm not sure we talk enough about his commitment to fight for workers' rights for fair wages and better working conditions. "Men, women and children contributed to the strike in 1968. Whole families sacrificed their comforts. They suffered for the cause. However, Dr. Martin Luther King Jr. paid the highest cost. 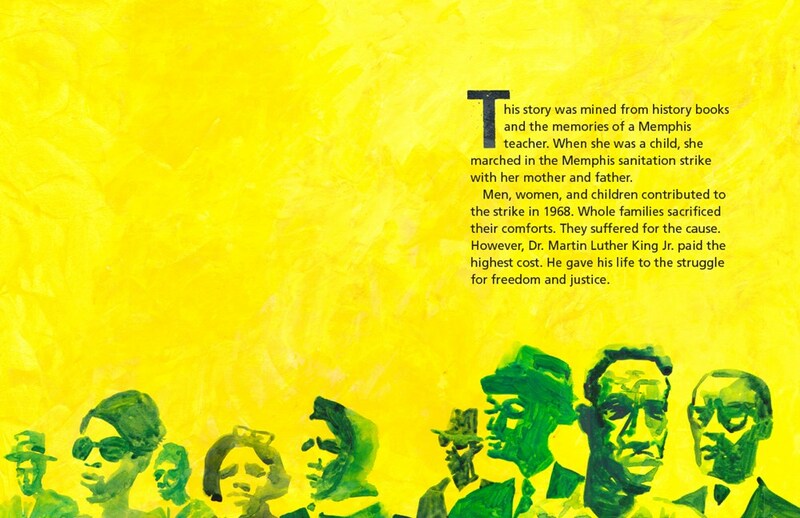 He gave his life to the struggle for freedom and justice." 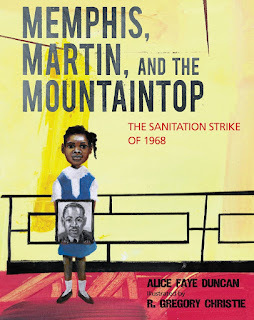 Duncan brings young readers into this story centering it on Lorraine Jackson, whose father was a striking sanitation worker. Duncan bases her character on Dr. Almella Starks-Umoja, whose father helped organize the strike. The author deftly moves between helping readers connect to Lorraine and providing information about the bigger issues at stake. "I remember Memphis and legions of noblemen. I remember broken glass and the voice of a fallen King." As the story begins, we learn about the sanitation workers' strike and the tragic deaths of two black garbagemen because of old, unsafe equipment. "Daddy told Mama, 'It ain't right to die like that.' Mama shook her head, and I saw a new storm rising up. I saw it in their eyes." This detail helps young readers feel the tension and understand the injustices. Throughout, Duncan highlights the dedicated efforts of community and the personal cost of striking. "My daddy marched in that number. He marched for better pay. He marched for decent treatment. My daddy marched for me." Dr. Martin Luther King Jr. came to Memphis to help the striking men, inspiring them to keep fighting for better pay and working conditions. Through young Lorraine's voice, Duncan tells about King's "Poor People's Crusade" to fight for the working poor, using the Memphis strike to draw national attention to the larger problems. "But as Daddy's soles wore think on his mountain climb, there came a spark of light. Good news filled the air." "Since Martin had conquered giants in the valley of injustice, Reverend Lawson believed his powerful friend could help the striking men." "I was there on that stormy night Dr. King returned. Clouds blotted out stars in the Memphis sky. Wind whipped through the bending trees." Illustrations copyright ©2018 R. Gregory Christie, shared by permission of the publishers. The review copy was kindly sent by the publisher, Calkins Creek, an imprint of Highlights. If you make a purchase using the Amazon links on this site, a small portion goes to Great Kid Books. Thank you for your support. I agree that we don't often see this side of MLK. Thanks for introducing me to this book!